The relationship between Christian belief and history is important because hundreds of millions of Muslims deny the historical event of Jesus’ death on the cross.2Faith (including secular assumptions about the impossibility of miracles!) does not establish the truth or falsehood of historical events. Rather, the Hebrew-Christian faith “arose out of the historical experiences of Israel, old and new, in which God made Himself known. This fact imparts to the Christian faith a specific content and objectivity which set it apart from others” (George Eldon Ladd). One of Islam’s major deviations from the Abrahamic religions of Judaism and Christianity is that Islam is unhitched from God’s work in history. By this I mean that Islam rests entirely on the recitation and life of a single man and Muhammad’s claims to what happened centuries before him. The significance of this fatal aberration cannot be overemphasized. Some Muslims have tried–unsuccessfully–to resurrect Islam from this fatal flaw by claiming the corruption of previous revelation. The reality is that Islam’s dependence on the recitation of a single man is novel and a corruption of Abrahamic religion. 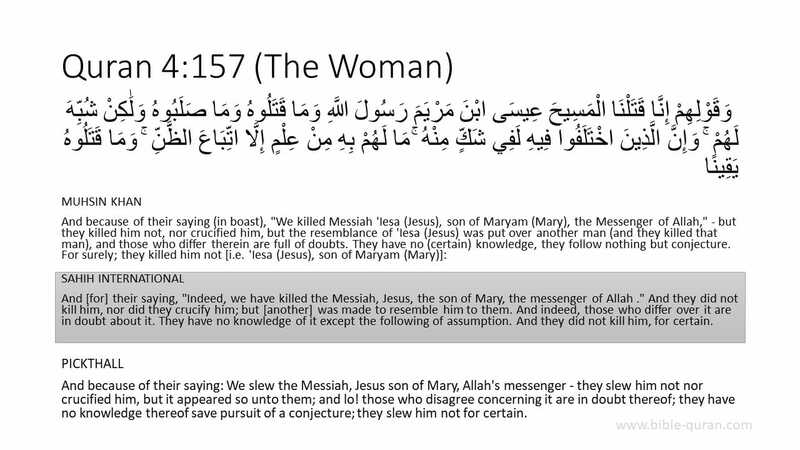 157And because of their saying (in boast), “We killed Messiah ‘Iesa (Jesus), son of Maryam (Mary), the Messenger of Allah,” — but they killed him not, nor crucified him, but the resemblance of ‘Iesa (Jesus) was put over another man (and they killed that man), and those who differ therein are full of doubts. They have no (certain) knowledge, they follow nothing but conjecture. For surely; they killed him not [i.e. ‘Iesa (Jesus), son of Maryam (Mary)]: 158But Allah raised him [‘Iesa (Jesus)] up (with his body and soul) unto Himself (and he is in the heavens). And Allah is Ever All-Powerful, All-Wise. (An-Nisa 4:157-158, Muhsin Khan3The Muhsin Khan translation of the Quran’s meaning is often distributed to Hajj pilgrims in Saudi Arabia. It is not just an interpretation of the Quran’s meaning but also a commentary on the Quranic text.) 4Quran 4:157 is the only verse in the Quran that refers to the crucifixion of Jesus and is the text Muslims have interpreted to mean that Jesus did not die on the cross. There is a story that a group of Jews insulted Jesus and his mother, whereupon he appealed to God against them. When God transformed those [who had insulted them] into monkeys and swine, the Jews took counsel to kill Jesus. Then God told Jesus that He would raise him up to heaven, and so Jesus said to his disciples: “Who among you will agree to take a form similar to mine and die [in my place] and be crucified and then go [straight] to paradise?” A man among them offered himself, so God changed him into a form resembling Jesus’ and he was killed and crucified. Others say that a man pretended [to be a believer] in Jesus’ presence but then went off and denounced him, whereupon God changed the man into a form similar to that of Jesus, and that he was seized and crucified.5Translated in Francis E. Peters, Judaism, Christianity, and Islam: The Classical Texts and Their Interpretation, vol. 1, From Covenant to Community, chap.3, no.30 [Princeton: Princeton University Press, 1990], 151. 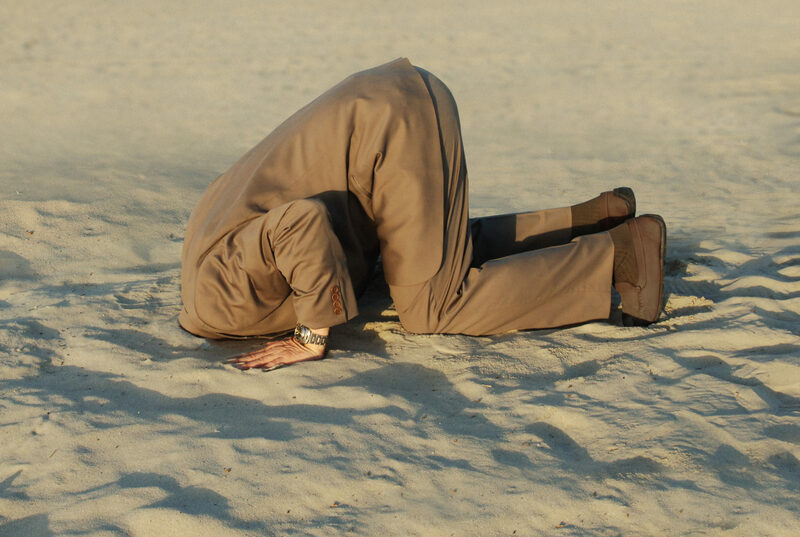 Can a person see, hear and learn about what God has done in the world He created when they won’t consider the facts? Observation, witness, testimony, and human analysis have little or no role in learning about what happened centuries ago at Golgotha. The only thing that ultimately matters is that Muhammad claimed an angel revealed to him something about the past contrary to what was observed and recorded. This is all in spite of the fact that Muhammad came hundreds of years after the event, lived hundreds of miles away, and did not provide any evidence. Isaiah 53:7-9 He was oppressed and He was afflicted, Yet He did not open His mouth; Like a lamb that is led to slaughter, And like a sheep that is silent before its shearers, So He did not open His mouth. By oppression and judgment He was taken away; And as for His generation, who considered That He was cut off out of the land of the living For the transgression of my people, to whom the stroke was due? His grave was assigned with wicked men, Yet He was with a rich man in His death, Because He had done no violence, Nor was there any deceit in His mouth. Matthew 26:6-12 While Jesus was in Bethany in the home of a man known as Simon the Leper, a woman came to him with an alabaster jar of very expensive perfume, which she poured on his head as he was reclining at the table. When the disciples saw this, they were indignant. “Why this waste?” they asked. “This perfume could have been sold at a high price and the money given to the poor.” Aware of this, Jesus said to them, “Why are you bothering this woman? She has done a beautiful thing to me. The poor you will always have with you, but you will not always have me. When she poured this perfume on my body, she did it to prepare me for burial. Josephus (Jewish historian born around AD 37 and died AD 100) refers to Jesus’ death (Antiquities 18.3.3).7The text reads, “When Pilate, at the suggestion of the principal men among us, had condemned him to the cross…” This passage, called the Testimonium Flavianum, is disputed, and its entirety should not be accepted as original to Josephus. However, the renowned scholars John P. Meier and Joseph Klausner accept the reference to Jesus’ crucifixion as authentic. Tacitus (AD 55-120), a renowned historian of ancient Rome wrote around AD 115 that Christ was “executed” by Pilate (Annals 15.44).8Muslims sometimes reject the authenticity or relevance of Josephus and Tacitus. But are they able to give the historic evidence for their version of what happened? Multiple eyewitnesses saw Jesus resurrected:9Resurrection means to see a person standing/living again after they die. According to Gary Habermas, there has been an increasing trend of scholarly research that is coming to similar conclusions as Gerd Lüdemann and Bart Ehrman. To learn more, see Gary Habermas’ survey of scholarly publications, Resurrection Research from 1975 to the Present: What are the Critical Scholars Saying? It is a legal requirement of the Mosaic law to believe the testimony about Jesus’ death on the cross and resurrection from the dead. The law/Torah requires that a matter be established by two or three witnesses (Deuteronomy 17:6-7). There were hundreds of witnesses to Jesus’ resurrection from the dead (1 Corinthians 15:1-8). Therefore, the testimony of Jesus, Old Testament prophets, Jesus’ followers, non-Christian historians, etc. is true, legal and is to be believed. The Quran and followers of the Quran are uncertain about what happened during the crucifixion and why the followers of Jesus testified to Jesus’ death on the cross and resurrection from the dead. This claim is not true. This claim was made hundreds of years after the event and has no historical support from the first century; none of Jesus’ followers wrote or testified that Jesus only appeared to die on the cross. The Quran does not explain who died on the cross, it does not explain whether the disciples of Jesus were deceived, and it does not explain why Allah has allowed the world to be deceived (or did Allah deceive the world?) about this for hundreds of years. It is Muslims who conjecture; Muslims who have no certain knowledge; Muslims who are full of doubts about what actually happened during the crucifixion. All Christians (Roman Catholic, Orthodox, and Protestant) agree that Jesus died on the cross. To be sure, Christians don’t agree about everything. There’s a lot we disagree about. But one thing Christians all agree about is the death of Jesus on the cross. Even non-Christian historians11“One of the most certain facts of history is that Jesus was crucified on orders of the Roman prefect of Judea, Pontius Pilate” (Bart Ehrman, The Historical Jesus: Lecture Transcript and Course Guidebook, Part 2 of 2 [Chantilly, VA: The Teaching Company, 2000], 162). are in overwhelming agreement about the historicity of Jesus’ death on the cross.12This is significant because Muslims believe in a concept called Itmam al-hujjah (Arabic for “completion of proof”). Itmam al-hujah is the belief that religious truth has been completely clarified by a Messenger of Allah. When it comes to the death of Jesus on the cross – Jesus, the Scriptures, and history are clear. If Muhammad was a Messenger of Allah, then he most certainly did not bring clarity or “completion of proof” by denying the historic event of Jesus’ death on the cross. Muhammad’s lack of clarity and Muslim confusion about what really took place during the crucifixion is proof that Muhammad was not a Messenger of Allah. To put it simply, the Law of Moses makes it unlawful, illegal, and therefore sinful to believe the Quran. The evidence and facts for Jesus’ death on the cross and resurrection are before you. You need to make a judgment based on the facts. It is not only immoral to reject God’s works. It is irrational. Serious problems arise when a person’s beliefs about the world don’t correspond to the real world. The story is told of a certain psychiatric patient who kept insisting that he was dead. Doctors tried and tried to persuade him that he was alive and not dead with little success. Finally, the decided to prove this by explaining to him scientifically that dead people don’t bleed, only living people. I invite you to embrace Christianity as the truth and only way of salvation. Jesus said, “I told you that you would die in your sins; if you do not believe that I am the one I claim to be, you will indeed die in your sins” (John 8:24). Believe in Jesus, and be baptized for the forgiveness of your sins, and you can have certainty that you will inherit eternal life. This certainty is rooted in what God has done in the real world with respect to the death of Jesus on the cross, His burial, resurrection, and ascension into heaven. Was Muhammad a true prophet? If so, can you answer this question? Anawati, G.C., “Isa.” In Encyclopaedia of Islam, (Leiden, E.J. Brill 1986-2004). Ayoub, M. M., “Toward an Islamic Christology, II: The Death of Jesus, Reality or Delusion?” The Muslim World, 70: 91–121. Bauckham, Richard, Jesus and the Eyewitnesses: The Gospels As Eyewitness Testimony. __________, The Gospels as Historical Biography. __________, The Gospels as Micro-History and Perspectival History. Brown, Raymond, “Imaginative Rewriting that Nullifies the Crucifixion.” In The Death of the Messiah (New York: Doubleday, 1994), 1092-1096. Craig, William Lane, Jesus’ Resurrection: Fact or Figment? : A Debate Between William Lane Craig and Gerd Ludemann (IVP Academic, 2000). Crossan, John Dominic, The Historical Jesus: The Life of a Mediterranean Jewish Peasant (New York: HarperSanFrancisco, 1993). ________________, Who Killed Jesus? : exposing the roots of anti-semitism in the Gospel story of the death of Jesus (San Francisco: HarperSanFrancisco, 1995). Din, Muhammad, “The Crucifixion in the Koran: The Moslem Point of View.” The Muslim World, 14:23-29. Edwards, William D., MD; Wesley J. Gabel, M.Div. ; Floyd E. Hosmer, MS, AMI; “On the Physical Death of Jesus Christ,” Journal of the American Medical Association 21 March 1986; Volume 255, 1463. France, R.T., The Gospels as Historical Sources for Jesus, the Founder of Christianity. Gairdner, William Henry Temple, The Eucharist as Historical Evidence (Cairo: The Nile Mission Press, 1910). Habermas, Gary and Mike Licona, The Case for the Resurrection of Jesus (Kregel Publications, 2004). Habermas, Gary, The Historical Jesus: Ancient Evidence for the Life of Christ (Joplin, MI: College Press, 1996). Lawson, Todd, The Crucifixion and the Qur’an: A Study in the History of Muslim Thought (Oxford: Oneworld Publications, 2009). Machen, J. Gresham, “History and Faith.“ The Princeton Theological Review, 13.3 (July 1915), 337-351.
al-Qayrawani, Faris, Was Christ Really Crucified? (Villach, Austria: Light of Life, 1994). Robinson, Neal, Christ in Islam and Christianity (Albany: State University of New York Press, 1991). Robinson, Neal, “Crucifixion”, in: Encyclopaedia of the Qurʾān, General Editor: Jane Dammen McAuliffe, Georgetown University, Washington DC. Sanders, E.P. The Historical Figure of Jesus (London: Allen Lane Penguin Press, 1993). Schirrmacher, Christine. The Crucifixion of Jesus in View of Muslim Theology. Siddiqui, Muzammil. What happened on the day of crucifixion? ; World Fatwa Management and Research Institute (INFAD); Islamic Science University of Malaysia. Smith, Jay. Did Jesus Die on the Cross? Stewart, Robert B. (editor), The Resurrection of Jesus: John Dominic Crossan And N.T. Wright in Dialogue (Fortress Press, 2006). Warfield, Benjamin, “The Resurrection of Christ: A Historical Fact.” Originally published in The Journal of Christian Philosophy, vol. III., 1884, pp. 305-318. Wenham, John, Easter Enigma: Do the Resurrection Stories Contradict One Another? (Cambridge University Press, 1993). Who was Jesus? Did He Rise from the Dead? : A Muslim-Christian Debate between John Warwick Montgomery and Shabir Ally held in London, England on October 17, 2003. Zwemer, Samuel, The Glory of the Cross, (London: Marshall, Organ & Scott, 1928). 2. ↥ Faith (including secular assumptions about the impossibility of miracles!) does not establish the truth or falsehood of historical events. Rather, the Hebrew-Christian faith “arose out of the historical experiences of Israel, old and new, in which God made Himself known. This fact imparts to the Christian faith a specific content and objectivity which set it apart from others” (George Eldon Ladd). One of Islam’s major deviations from the Abrahamic religions of Judaism and Christianity is that Islam is unhitched from God’s work in history. By this I mean that Islam rests entirely on the recitation and life of a single man and Muhammad’s claims to what happened centuries before him. The significance of this fatal aberration cannot be overemphasized. Some Muslims have tried–unsuccessfully–to resurrect Islam from this fatal flaw by claiming the corruption of previous revelation. The reality is that Islam’s dependence on the recitation of a single man is novel and a corruption of Abrahamic religion. 3. ↥ The Muhsin Khan translation of the Quran’s meaning is often distributed to Hajj pilgrims in Saudi Arabia. It is not just an interpretation of the Quran’s meaning but also a commentary on the Quranic text. 4. ↥ Quran 4:157 is the only verse in the Quran that refers to the crucifixion of Jesus and is the text Muslims have interpreted to mean that Jesus did not die on the cross. 5. ↥ Translated in Francis E. Peters, Judaism, Christianity, and Islam: The Classical Texts and Their Interpretation, vol. 1, From Covenant to Community, chap.3, no.30 [Princeton: Princeton University Press, 1990], 151. 7. ↥ The text reads, “When Pilate, at the suggestion of the principal men among us, had condemned him to the cross…” This passage, called the Testimonium Flavianum, is disputed, and its entirety should not be accepted as original to Josephus. However, the renowned scholars John P. Meier and Joseph Klausner accept the reference to Jesus’ crucifixion as authentic. 8. ↥ Muslims sometimes reject the authenticity or relevance of Josephus and Tacitus. But are they able to give the historic evidence for their version of what happened? 9. ↥ Resurrection means to see a person standing/living again after they die. 11. ↥ “One of the most certain facts of history is that Jesus was crucified on orders of the Roman prefect of Judea, Pontius Pilate” (Bart Ehrman, The Historical Jesus: Lecture Transcript and Course Guidebook, Part 2 of 2 [Chantilly, VA: The Teaching Company, 2000], 162). 12. ↥ This is significant because Muslims believe in a concept called Itmam al-hujjah (Arabic for “completion of proof”). Itmam al-hujah is the belief that religious truth has been completely clarified by a Messenger of Allah. When it comes to the death of Jesus on the cross – Jesus, the Scriptures, and history are clear. If Muhammad was a Messenger of Allah, then he most certainly did not bring clarity or “completion of proof” by denying the historic event of Jesus’ death on the cross. Muhammad’s lack of clarity and Muslim confusion about what really took place during the crucifixion is proof that Muhammad was not a Messenger of Allah.